But the events that took place on October 23rd may indicate a fundamental shift toward the development of a united liberal opposition movement. The national holiday was a litmus test for the failing of old opposition powers, the continued strength of right-wing forces, and potential new alliances’ strengthening unity among grassroots and political opposition. The state of Hungary’s liberal-left political forces has been bleak in recent years. The main opposition party MSZP (The Hungarian Socialist Party) enjoyed electoral victories in the 2002 and 2006 elections but has greatly diminished support since scandals in 2006. Left wing forces were crushed further after the 2010 elections when MSZP’s ally, liberal party SZDSZ (Alliance of Free Democrats) failed to gain enough support to enter parliament. By October 2011 the former MSZP Prime Minister, Ferenc Gyurcsány, announced that he would be leaving MSZP with a faction of its members to create a new centre-left party, Democratic Coalition (DK). The downfall of MSZP was displayed in full by the party’s absence from the public events on October 23rd. The party opted to have a more private affair at Budapest’s Flamenco Hotel, where the party’s president, Attila Mesterházy, along with other officials, conducted speeches and mingled. Since the party has been criticized by the right for being untrustworthy and catering more to European interests than the needs of the nation, this elite gathering will not help perceptions. The Green Party, LMP, who has been a unique new addition to the Hungarian parliament since 2010, drawing on Budapest-based youth support, was also surprisingly absent from public events. LMP has battled to remain politically neutral from right-left divisions, which has hurt the party’s ability to widen its support network. 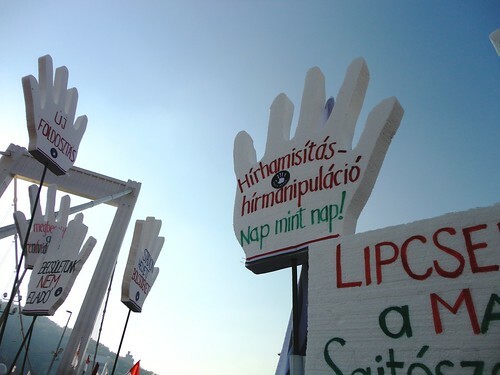 LMP’s website stated that they would not be holding an official LMP event, though they explicitly stated that they were not a part of the alternative opposition demonstrations being held by grassroots movements Egymillióan and Szolidaritás (‘One Million’ and ‘Solidarity’ – the two main anti-government grassroots movements). Meanwhile, Fidesz remains an icon of strength and determination. The party has kept its main figureheads mostly intact since 1989, despite shifting from a liberal youth party to a nationalist conservative party. Viktor Orbán remains the unquestioned leader of the party, able to rally the masses during speeches with an audience of dedicated supporters cheering not only for the party but for Orbán himself. This was evident on October 23rd with a strong turnout of followers starting with pro-government grassroots groups staging a ‘peace march’ that ended up joining the throngs of government supporters in front of Parliament. Fidesz continues to propagate anti-EU rhetoric, personifying the IMF and Brussels as oppressive characters akin to the 1848 and 1956 forces that Hungary had to rise against, yet the party will continue to be seen as moderate right as long as the strong presence of radical right party, Jobbik, remains. While Fidesz gave speeches in front of parliament to throngs of dedicated supporters, the radical right staged their own demonstrations in the centre of Budapest bringing in their own hoards of supporters, largely attended by groups of younger Hungarians as well as older hard line nationalists. What initially seemed like a dysfunctional competition of six separate demonstrations boiled down to Hungary’s original bipolar divide. For the first time in recent years different, parts of a fractured left vocalised the need for opposition efforts to work together. Ex-Prime Minister Ferenc Gyurscány gave the final speech at DK’s gathering announcing that he would be supporting Gordon Bajnai in the 2014 elections. Bajnai is a widely popular politician who led the interim Socialist government before the 2010 elections. He refrained from running in the 2010 elections and has since remained an independent politician. Hundreds of DK followers marched together to join the tens of thousands of opposition protesters at Elizabeth Bridge, uniting the grassroots opposition efforts of Egymillióan and Szolidaritás. The two movement leaders signed a pact with Bajnai called ‘Together 2014’ to rally political and grassroots opposition forces together. The cooperation agreement is meant to start bringing opposition efforts together, though it is still uncertain if other major political forces such as the Socialist Party (MSZP) and Green Party (LMP) will be potential Together 2014 joiners. LMP has continued to maintain that no cooperation with former Socialist members or Bajnai is possible while the Socialist Party has remained unclear towards the new pact. What remains certain is that a strong civil backing for right wing and radical right networks cannot be overpowered by anything less than a fully united opposition. Time will tell if opposition organisations and parties will be able to put aside their differences and unite, as the right wing has successfully done since the mid 1990’s, before the 2014 elections. This piece was first published by Policy Network and is reproduced with permission.